Celebrity chef and founder of Ballymaloe Cookery School, Dr Darina Allen, passed on her culinary expertise to hospitality students during a visit to the University of Ulster’s Belfast campus. Dr Allen, vice chair of Safefood's Advisory Board and an honorary doctor of the University of Ulster, was given a guided tour of the University’s Academy restaurant. During the visit she had the opportunity to meet students who had developed a specially prepared ‘gourmet experience’. Welcoming one of Ireland’s most successful chefs, Dr Una McMahon-Beattie, Head of Department of Hospitality and Tourism Management in the Ulster Business School, said: “This is an excellent opportunity for our students to be exposed to the culinary knowledge and expertise of Darina Allen. The University’s Academy restaurant provides students with the skills and knowledge required for their academic programme of study and the practical experience for the hospitality and tourism industry. The restaurant includes operational and skills development kitchens and seats 70 people. Safefood is the body responsible for promoting healthy eating and food safety and its Advisory Board provides strategic advice to the Chief Executive and Senior Management team. Darina visited the University as part of Safefood’s 12-member Advisory Board, which held a meeting in the Belfast campus. Dr Allen received an honorary doctorate from the University of Ulster in 2003 and her daughter-in-law Dr Rachel Allen also received an honorary doctorate from the University earlier this year. 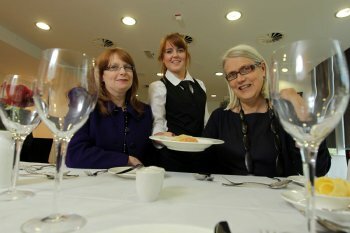 Caption: Darina Allen (right) is pictured with Una McMahon-Beattie, Head of Department for Hospitality and Tourism Management at the University of Ulster (left) and student Rachel Morrow (centre).